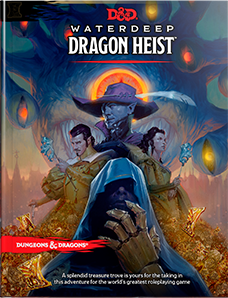 Last week, I began the prelude to Waterdeep: Dragon Heist for DnD 5E. It's a prelude because one of our players is out for three weeks, but I really wanted to get the game going. The Characters are 1st level and are made up of a Loxodon, Minotaur, Triton, and Tiefling. I decided that Waterdeep would be very cosmopolitian, so it wouldn't be a big deal (for instance, instead of being from Ravnica, Loxodons are from Chult and make their home in Ivorytown in the City of Splendors). The characters have all been recruited by the Lord's Alliance and meet up, not knowing each other, to follow a scrawny rat-faced human and rescue a human, male sculptor. Great roleplaying and hi-jinks ensue, of course. An urban druid who seemed dead set on not letting the slavers of the Red Door, who rat-face works for be disturbed was stabbed through the heart, his corpse left in the alley by their HQ, moments before the players raided the place. Though heavy-handed their plan worked out, but a human got away, escaping through a hatch in the floor that leads into the sewers and presumably the man they are hunting for. I have bright hopes for this game. I don't know how long the Factions will be at the front, but I'm hoping to get some intrigue going as one player has ties to another Faction besides the Alliance.